One of my successful smoothie experiments! This great tasting smoothie is packed with vitamins, minerals, fibre, protein, essential fatty acids, and if you make it with low-fat yogurt, it's low fat too. 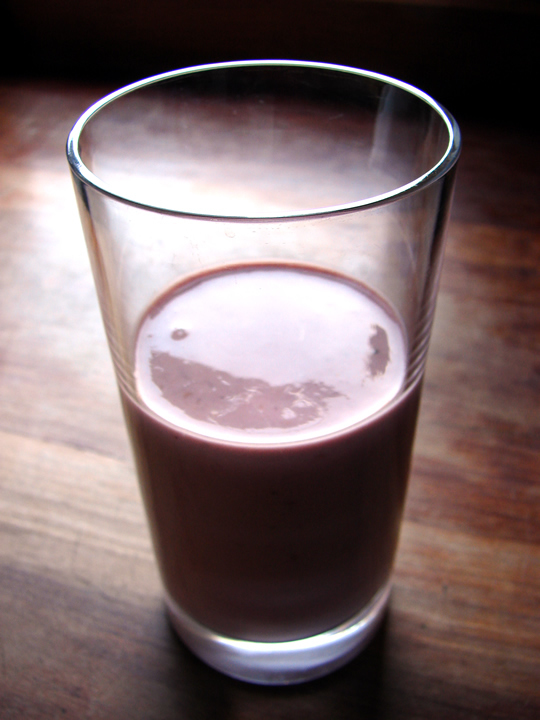 It's a complete meal in a glass! Blend all ingredients with a hand-blender until smooth. Then drink! The recipe for this squidgy chocolate cake was given to me by a friend, who found the original, handwritten version in an old recipe book that belonged to her great grandmother. So not technically my experiment, but someone's experiment none-the-less! The original recipe called for “a block of black molasses sugar ground until fine” and orange flower water as the flavouring. Line a deep, 9” cake or loaf tin with non-stick baking paper (essential!) and pre-heat oven to 400 degrees Fahrenheit. Melt chocolate in a bowl placed in a pan of boiling water. Cream butter and sugar together. Add beaten eggs and vanilla – mix well, but no need to get it airy. Add melted chocolate and mix. In a separate bowl, mix together the bicarbonate of soda and flour and put boiling water in a jug. Now … add 1 x TBSP of hot water to the chocolate mixture, mix, and then add 1 x TBSP of the flour/bicarbonate and mix – continue in this way until all is incorporated into the chocolate mixture. You will end up with what looks like a smooth chocolate batter. DON’T PANIC – it’s supposed to look like this! Stir in the chocolate chips. Pour mixture into cake/loaf tine and bake for 30 minutes at 400 F, then place a sheet of foil over the top of the cake (to stop it burning), turn oven down to 375 F, and bake for a further 15-20 minutes. Stick a skewer into the centre of the cake and it should come out slightly sticky – this means that the cake is cooked. Take out of oven and leave to cool COMPLETELY before removing it from the tin. It will sink a bit – this is normal. The cake is best stored for a couple of days in an airtight tin (like gingerbread) before eating. Ensure that you do not tell anyone else where you have put it, or there will be none left for you! There is no need to ice this cake - it really is best served on its own, or with cream and raspberries. 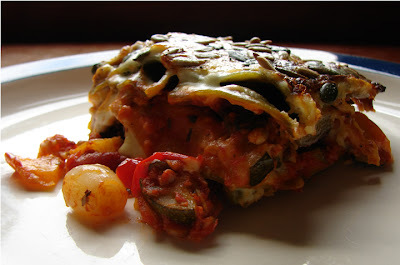 I’ve been vegetarian for over 25 years and this is one of my favourite dishes - delicious and nutritious, cheesy and nutty vegetable lasagne! I prefer to use organic ingredients where possible, and find that organic pumpkin seeds in particular are much nuttier and larger than non-organic ones. ‘Seeds of Change’ tomato and basil pasta sauce is a good choice too. Preparation time 30-40 minutes. Cooking time 35-40 minutes. Serves 6 good-sized portions. 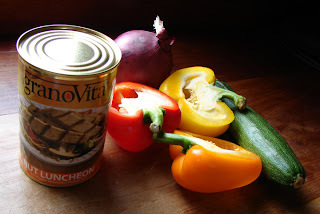 To make the vegetable sauce, dice the Nut Luncheon, onion, courgette and peppers and add to a large frying pan with the olive oil, sunflower seeds and pumpkin seeds. Fry on a medium heat until everything starts to brown, then add the jar of tomato and basil sauce. Stir well, then remove pan from heat. For the cheese sauce, on a low-medium heat, in a small saucepan melt the margarine and then add the flour, stirring the two together to make a thick ball of paste (this is called ‘roux’), then add ¼ pint of milk. With a wooden spatula, stir, stir, stir and keep stirring and beating until the mixture resembles thick, sticky batter. If you have never made cheese sauce before, this process can be pretty worrying and for a while will look like things have gone horribly wrong, but have faith – so long as you keep stirring, all those lumps WILL disappear. No need to squash the lumps or strain the sauce, just let the heat do all the work. Once the mix resembles thick, sticky batter, add in another ¼ milk and again, keep stirring until the heat has dissolved all the lumps and the mixture is smooth again – the consistency of thick but fluid batter this time – and then add the last ¼ milk. Stir until the mixture is smooth again, then add the mascarpone cheese and 2 oz of grated mature cheddar cheese. Continue to stir until the cheese is fully melted and blended. 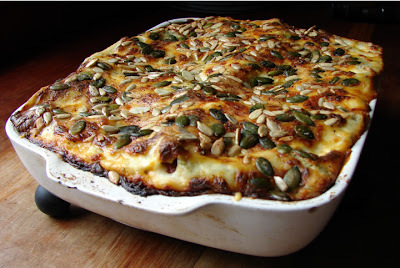 Line a 10” x 8 ”x 2” ovenproof ceramic dish with a single layer of lasagne. On top of this add half the vegetable sauce and spread evenly. Place a single layer of lasagne on top of the vegetable sauce, and on top of this, add half the cheese sauce and spread evenly. On top of this add a single layer of lasagne, then the rest of the vegetable sauce followed by another single layer of lasagne and finally, the remaining cheese sauce. 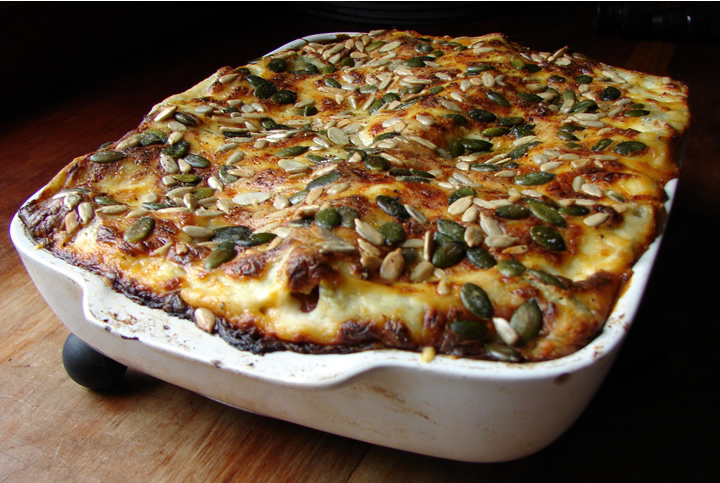 To top the lasagne, sprinkle on the 1 oz of grated cheddar, sunflower and pumpkin seeds, and season with salt and pepper. Cook in the centre of the oven, pre-heated to 350F, for 35-40 minutes. Baker’s tip ~ if you are not familiar with Nut Luncheon and once opened, wonder how on earth you are going to get it out of the tin, remove the other end of the tin with an tin opener so that both ends are open, then taking a sharp, sturdy knife – the blade of which needs to be longer than the tin – slide the whole length of the blade between the Nut Luncheon and the side of the tin. Carefully, pressing the full length of the blade against the tin, drag the knife around the tin, thus freeing the Nut Luncheon from the wall of the tin. Remove the knife. Then, holding the tin with both hands and one end facing directly down, with long swings, shake the tin hard so that the Nut Luncheon begins to slide out of the downward-facing end. When you have shaken it out about halfway, slice the exposed Nut Luncheon from the tin. To dice, slice into 4 even rounds and then stacking the rounds on top of one another, dice into cubes. Store the rest of the Nut Luncheon in the fridge and consume within 3 days – you could slice and fry it as ‘burgers’, or make another lasagne! 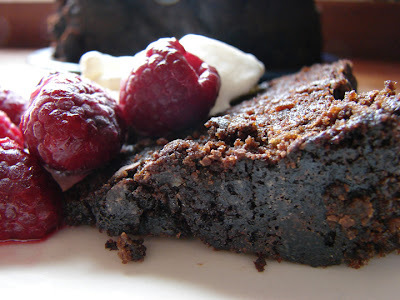 A wonderfully moist and sticky cake. Preparation time 20 mins, cooking time 1 hour. 3 x medium Bramley apples, peeled, cored and grated. 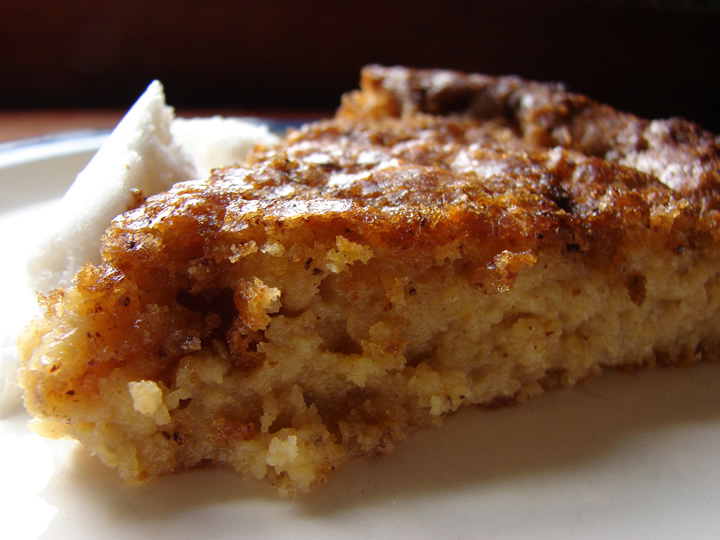 1 oz soft brown sugar & 2 x teaspoons ground cinnamon for topping the cake. Beat margarine and sugar together in a bowl. Add mascarpone cheese and vanilla essence and beat until smooth. Mix together flour, cinnamon, baking powder and salt in a separate bowl, then stir half of this into the mixture. Break and beat 1 egg into the mixture. Add the remaining dry ingredients and stir in, then crack and beat in egg number 2. Fold in grated apple, pour into 9" greased, springform tin. Sprinkle over cinnamon and sugar topping, bake at 350F for 30 minutes, then cover with a sheet of baking parchment and bake for a further 30 minutes. Serve warm with vanilla ice-cream. Baker's tip ~ peel and grate each apple directly into the mixture to keep the apple from going brown. This will help to preserve the sharp taste of the apple. A flart is a cross between a flan and a tart. Crumb flour, fat & sugar together, then mix in the egg. Mixture will resemble thick, sticky batter. Grease a 9" springform tin and spread in flart base mixture, drawing the batter up the sides and spreading it about until even-ish. Bake at 400F for 5mins, then prick base, and cook for further 10-15mins at 350F. Allow to cool. Peel, core and chop 4 x large Bramley apples, and stew with a little water, lemon juice and 2 x TBSP honey for 5mins. Take off heat, throw in a dozen large blackberries and then stir until mixture is evenly pink. Pour into flart base. Place flart into the refridgerator to set. 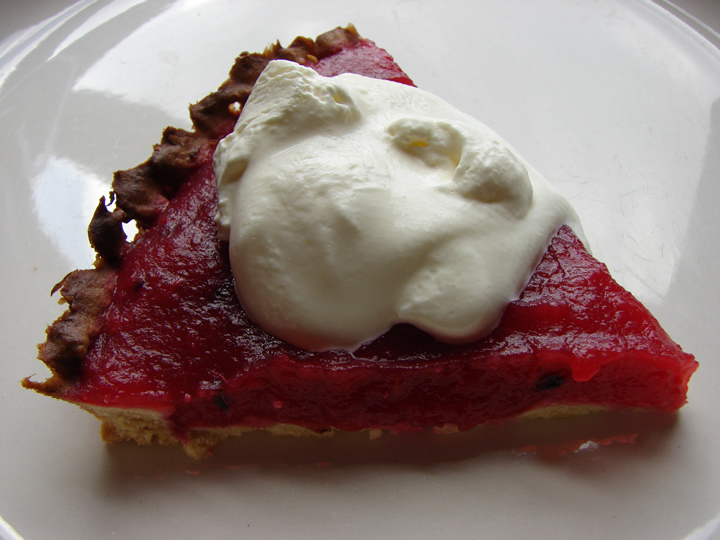 Serve with whipped double cream. 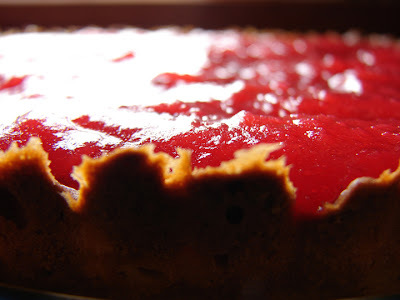 A 'flart' is a cross between a flan and a tart. 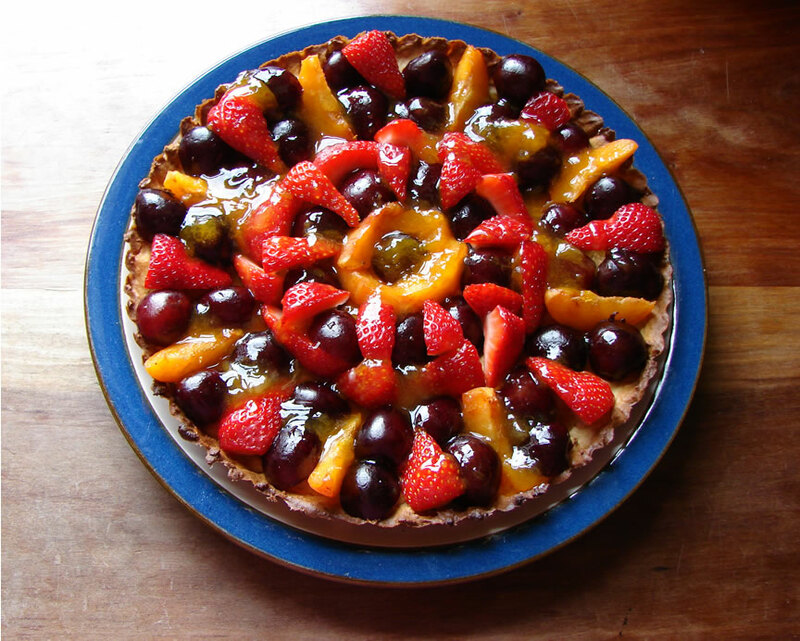 Prepare and slice fruits of your choice and arrange in a pattern in the flart base. The flart in the picture is strawberry, apricot and cherry. Stir together 1 x TBSP apricot jam, 1 x TBSP runny honey and 1 x TBSP hot water. 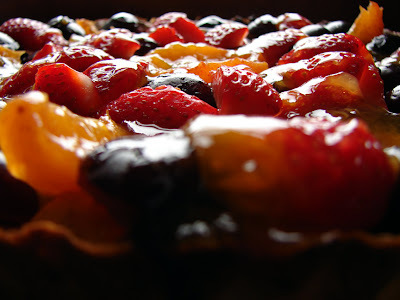 Drizzle evenly over the sliced fruit. Please note that 'Dog Blog' was writen when I was working as a Dog Behaviour Psychologist from 2005 - 2012. The blog is no longer updated with new posts. Copyright Lizi Angel 2011. Watermark theme. Theme images by carlosalvarez. Powered by Blogger.